There was an Art Club in Helensburgh between the First and Second World Wars to which many artists belonged. Some of the Glasgow Boys lived in Helensburgh, including W .Y .Macgreor, Lavery, Guthrie, and Walton.The Art Club had exhibitions in the Granary Building on Clyde Street. After the Second World War these artists were determined to form ‘’The Helensburgh and District Art Club’. The first committee meeting was in 1951. Among the first members were Charles Taylor (the first President), Gregor Ian Smith, Elspeth Beaton, May Howieson and George Burgess. They were lucky enough to have Sir Harry Jefferson Barnes on the committee. He was director of the Glasgow School of Art and brought a constant stream of practising, talented artists to give lectures and demonstrations to the club. The format was much as it is today, lectures, workshops, demonstrations, exhibitions, visits to the Art School and to Edinburgh and Glasgow exhibitions. Eventually a junior class was formed. The portrait class has always been popular. They also had a Christmas dinner or social evening. From the outset they searched for permanent premises that have never yet been found. The meetings were held in various venues. For a long time the Community Centre on Clyde Street was used until it was closed down in 2004. We then met in the Helensburgh Lawn Tennis club and have recently moved to Helensburgh Sailing Club. Groups meet in the small hall of St Andrew’s Kirk. 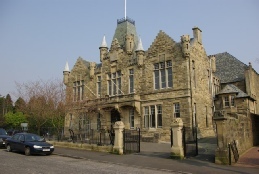 Exhibitions are usually held in the Victoria Halls, sometimes St Columba’s Church Hall. For a long time Miss A .T. Anderson was our Honorary President. When she died in 1980, she left her collection of Helensburgh pictures, painted mainly by Helensburgh artists, to the town. They are now held in our new library in the Anderson Trust where they are exhibited regularly. The first President was Charles Taylor who held the post for three years. Gregor Ian Smith then became the backbone of the club as president for 22 years. There have been 18 Presidents since then, each serving from between 1 to 5 years. The first annual subscription was 25p. There have been many notable exhibitions over the years. Included in the 1954 exhibition was a loan of pictures owned by the residents of Helensburgh. These included Raeburns, Ramseys, Peploes, Cadellls, Guthries, Hunters, Hornels, Sisleys, Daumiers, Toulouse Lautrec, Fantin Latour, Crawhall, and Edward Lear. In 1956, four Glasgow artists were invited to participate; Joan Eardley, Margaret Sandeman, Sinclair Thomas and William Crosbie. 1971 - exhibition included three Kilbarchan artists - Tom Shanks, Cynthia Wall, and Wiliiam Burnie. 1973 - exhibition included Guthries, Whitelaw Hamilton, Walton, James Paterson, and John Lavery who all painted in Helensburgh. 1976 - exhibition included works by the ‘’ Glasgow Girls‘’ including Nora Nelson Gray, who painted First World War paintings, Jesse King and Eleanor A Moore, Ailsa Tanner’s mother . Many distinguished artists have lectured and demonstrated including, Albert Morrocco, Emelio Coia, Richard Demarco, Jean Irwin, James Roberts, Alexander Goudie, John Millar, Anda Paterson, James Fullerton, Robert Kelsey, Hamish McDonald, Roger Bilcliffe, Cordelia Oliver to name but a few. Of course there have been and still are a wonderful band of loyal members who have supported the club and made all this possible. Our events programme has attracted, and continues to attract notable artists of the time. The aim of the club is to encourage would be artists to ‘have a go’ and to give artists of all abilities a platform on which to exhibit and to give those who appreciate art in all its forms a better understanding.